The results are finally in! Compactor did pretty well overall! The theme this year was “An Unconventional Weapon” and so we decided to go with the Compactor idea. We re-did the art and re-wrote the code from scratch. One of the most interesting pieces I worked on here was the One way pass through Ramp. I think it works pretty well most of the time though it could definitely use some tweaking. The game was finished in about 48 hours worth of work. Dan was unable to participate this time around, so I ended up having to do a lot more of the art than I’m used to! Spent most of my time in Illustrator and I think it came out pretty well. The ranking is shown below. The number is out of 5 possible stars. During my last trip out to GDC, I met some awesome indie developers. One of them was a developer from the Starbound team, one of my favorite indie games. I also met the team from Plants Vs Zombies who was there too. Anyway, Bart suggested I try my hand at the Ludum Dare Game Jam and since I already had the VS thing still in mind from meeting George and Laura, we decided to take a bunch of ideas and jam them together. Dan and I decided to try our hand at our first game jam which was just a Mini-LD. The theme was Pong, so we took the theme and inverted it. We then went and created some cute characters and art and tried to come up with some interesting VS idea. After some debate, we decided to go with Pirates VS Planets. The basic gist is simple, the Pirates are upset that the moon keeps messing with their Tides, so they decide its time to bring it down. The moon of course must defend itself from this attack! The moon of course isn’t defenseless. With all that mass the moon is able to slingshot asteroids and control itself in the night sky. Its a simple game, took me about 40 some hours of programming, and a couple days worth of Art on Dan’s side. I think it came out well, the balance is still a little wonky, but the mechanics seem to work. For the pirates, you must shoot a harpoon at the moon and tie it down. While the Moon commands its asteroids to try and knock pirates off the ship. For every harpoon the moon moves slower, and for every pirate lost, the ship moves slower. After 10 – 20 seconds the pirates can be picked up from the water. Likewise the moon can break the anchor points by aiming for them instead of for the ship. The winner’s reward is the destruction of their opponent in the most OP way possible. So after a nice summer vacation, we’re getting back to work on all of the games! Yes, lack of focus can be a problem, but it’s all in good fun right? 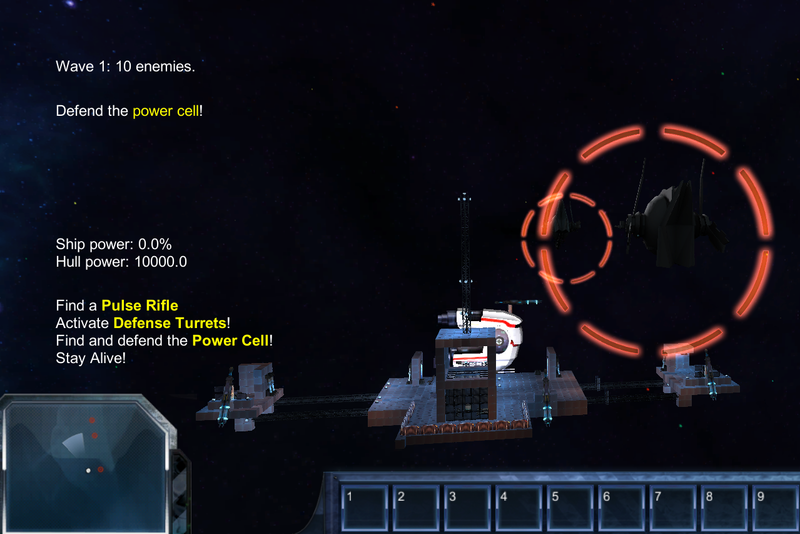 This week I’ve upgraded to the latest Unity3D and started cleaning up Solar Strike’s codebase. I’ve been fixing some of the really annoying bugs that were scattered all around. Namely the weapons just felt too slow. So I’ve sped them up, but that in turn ended up causing them to pass through objects! Which of course is no good, so I added ray casting to account for that. I also refactored the level loading system so that I plays nicely with levels that are imported directly from 3dsMax, and plays nicely with objects added in the Unity Editor directly. Overall, I removed about half the code that was there. I also revamped the physical appearance of the explosion weapon, it’s now an Implosion, and has a radius bubble to show you what its affecting. It also moves faster, and seems more realistic. So some time has past since updates! Things got really busy. I spent some time teaching a Video game design course @ university, so that slowed things down a bit. But now that’s all taken care of, I can get back to progress as well as status updates. Administratively, we now have an actual Wiki for the developers instead of just a fake WordPress -like Wiki, so that makes things a lot easier to keep track of. We also have moved our servers over to Git instead of Perforce. Unity really doesn’t play nice with Perforce, so this greatly improves the dev process. Dan and I have come up with a new idea for solar strike, which we plan to implement in the short term after we finish up Strikers. Strikers is a really small game, limited scope. 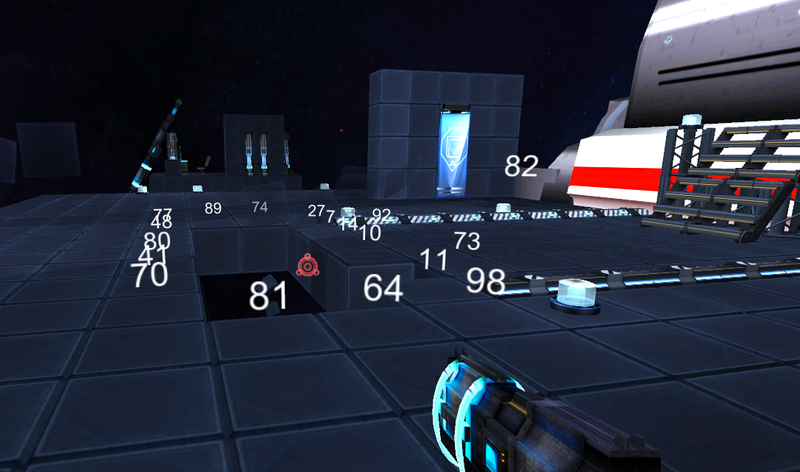 Capture the flag style game play with interchangeable mechs, weapons and power-ups. Its designed to be multi-player, but Dan wants to try his hand at writing some AI. I swear I’m going to force him to post to the blog about it. Even if no one reads it! Its good practice. As for game status. We’ve started work on a server for Strikers. It’s coming along slowly, and intermixed with other status improvements. Basically most of the work lately has been trying desperately to make Unity 2D physics play nice with the game. It’s really not an ideal situation they have going at the moment, I’m sure it will get better over time. Also, the built in unity Networking has a lot to be desired, so for now I’m bypassing it and writing my own. I’ve also improved the HP bars, as well as the unit ( mech ) transfer system. There is a brand new Modifier / Buff / Debuff system in place as well. One of the Mods is a Hoverpack, which every mech has built in. This lets me control the types of features each mech will have. I’ve also been slowly replacing the mechanim animations with my own Blender animations. The movement is finally starting to flow better. Less jerky, less getting stuck in between blocks.. I also went ahead and added some custom foley’d sounds just so the game isn’t so quiet. The demo went well, the game plays well, and looks pretty good, lots of bugs still of course. 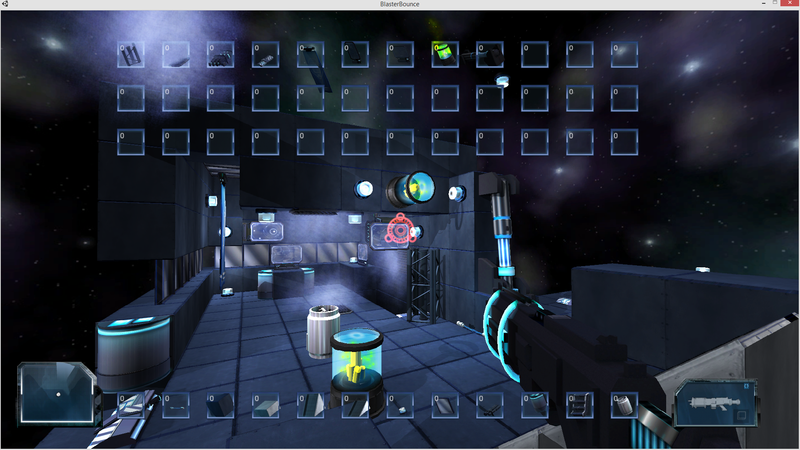 So this weekend, we worked on a full inventory system visual redesign. While the window doesn’t move yet, it is ready to be added, that way you can open inventory and place it where ever you like. Also, from last week, Dan added a very snazzy reflection shader onto the blocks. Sooooo shiny. It was too shiny, so I turned down the reflection a little bit as of today, but you can see how it looked on the first day below. Final push for a demo! So it’s been a while since I updated the site. But rest assured we’ve been hard at work. The final push is underway this week. The game now has Quests, States, Game flow, a boss, enemy spawners, waves of enemies, path finding, full inventory with drag drop, interactive objects, item pickups, power cells, defense turrets, weapon tracking, weapon charging, pulse grenades, regenerating blocks, HP Bars, and a very helpful ship that just needs to recharge before helping you with the boss. As well as countless new objects all with amazingly simple placement mechanics. 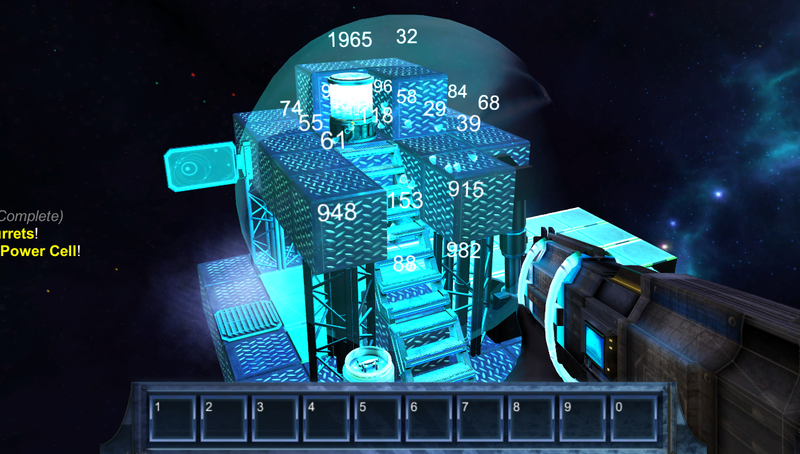 Interactive objects include the gun rack ( which now gives you the pulse rifle), crates, and monitor screens to activate and deactivate turrets. The game also now features enhanced AI as well. And finally my latest change, Good guys have blue lasers, and bad guys have red lasers.. The game is short, but its just meant to be a demo, overall there is about 10 minutes of play time. We build a small level to facilitate the game play, but the rest of the work this week will be tweaks and polishing. Followed by a power point write up, and finally releasing the game demo as open source. I think we’re settled on releasing the code as BSD ( fully open ) and the art as CC-BY-NC 3.0 (Creative Commons, By Attribution, Non-Commercial), but we’ll see after we have a chance to do some more research on the subject. I’ll have both a video game, as well an actual link to the playable game sometime this week or next week. In the mean time here is a picture from the sky, cheats are enabled now too, flying is totally awesome. So for the past few weeks I’ve been working on the inventory system as well as importing all the new objects that Dan has been creating. While I can’t drag and drop yet, I can at least change the current item by clicking and mouse wheeling the Equip bar. We also changed the color scheme to be very much more blue. Every item has a hint of blue somewhere in it. The visual place holders for Radar and current selected item have been added. Dan set the blocks to be much more dynamic, while this can cause overlapping blocks, its not that critical at this stage. Also, after getting some feedback from various sources we’re going to simplify the game play by making it a defense game, rather than an offense game. The enemies will be interested in obtaining by any means necessary the power crystals that will be placed in the world. You are tasked with defending these crystals by building a base around them and defending against various waves of enemies. Kind of like tower defense, but for the time being, much more limited, the focus is on creation. Here’s a screenshot of the current progress. Sorry about the mess, haven’t had a chance to clean up the base yet! Lots of random blocks scattered around.